Average water temperature during Apirl is around 20 degrees which means it will more than likely be a non wetsuit swim, however Technical Officials will measure the water temperature prior to each race and results will determine if wetsuits are permitted. The water temperature and ruling about wetsuits will be published on social media, the event notice board and via the public address system. 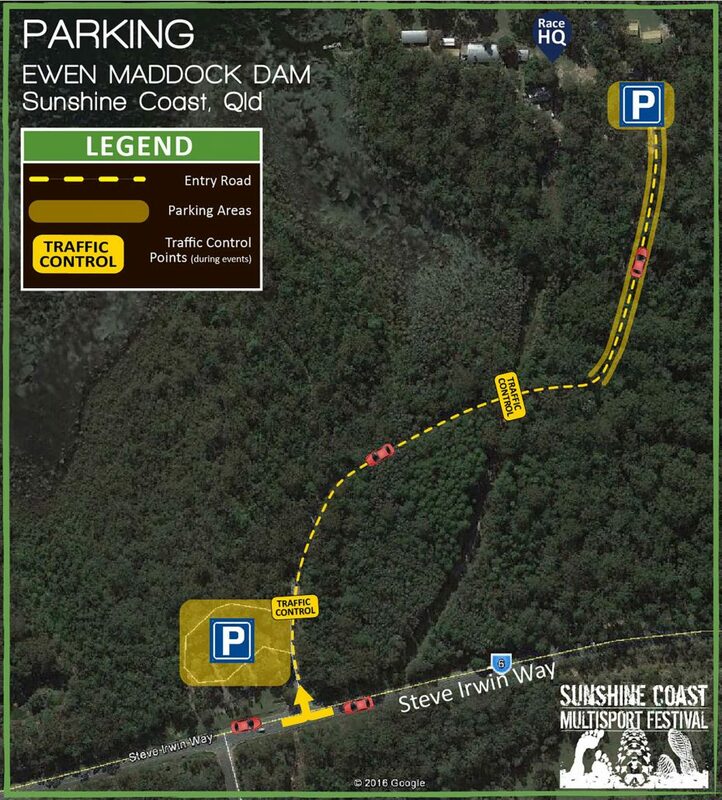 Ewen Maddock Dam is a fresh water dam and the water quality in the swim area has been tested and is suitable for swimming. Water clarity is fair, however there are some reed/weed patches in the dam. The swim course has been designed to avoid these area as much as possible, however please be aware that it is possible that while swimming you may come in contact reeds/weeds in the water. Swimmers are to avoid any areas where thick weeds are visible. Being an inland dam there are no currents or tides to contend with, however, on a windy day the dam surface can become slightly choppy. The event will commence with a running start from the sandy beach into the water. The water deepens quickly from the shore, minimal dolphin dives will be required. 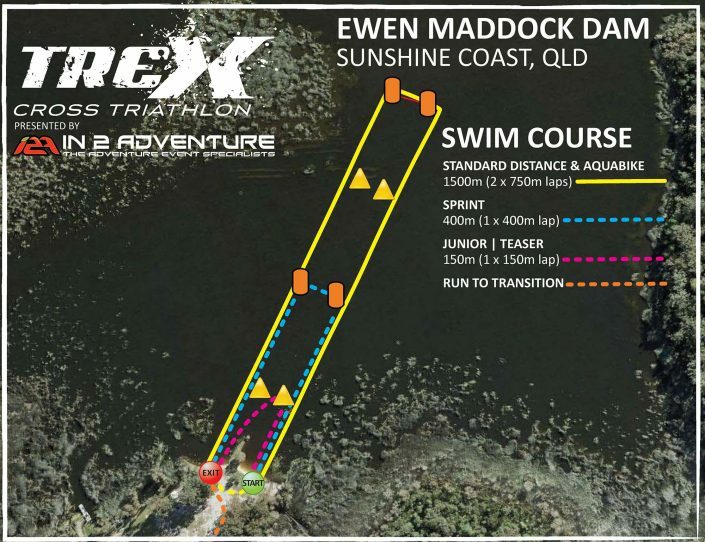 The swim course is an out and back anti-clockwise lap and is marked with 1.5m orange buoys and 1m yellow pyramids marking the inside circumference of the course. Swimmers keep these buoys on their left. New riders will enjoy the flowing nature of the course, while more experienced riders will love the pinchy climbs, creek crossings, bridges and roll overs. If you’re not too tired to look, you’ll also enjoy the panoramic views from many points along the course. 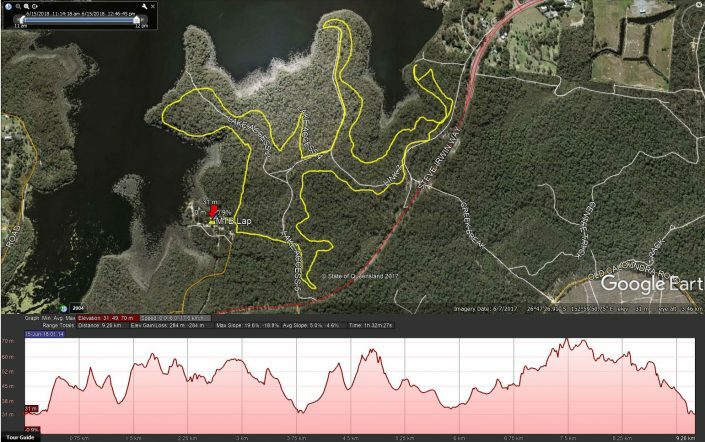 This spectacular and technically challenging trail run course is a 3.5km lap circumnavigating the Race HQ area. 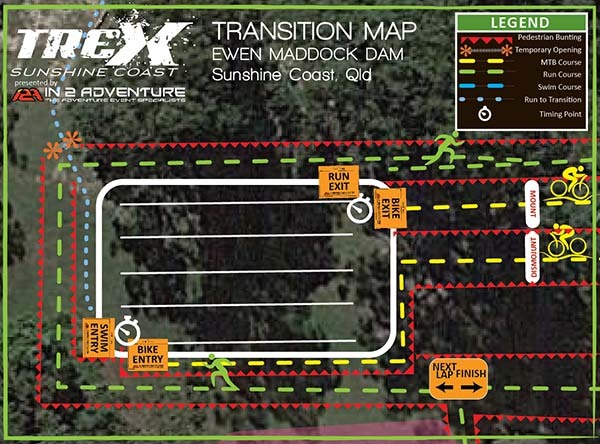 Standard competitors will complete 2 x 3.5km laps before finishing at Race HQ. This is one of the most picturesque run courses of the series with the majority of the trail running on winding single track through ferned rainforest. It includes uneven, rocky trails, a creek crossing, some open trails and, of course, more of what we love about cross triathlon… Wet & Muddy sections! The course passes back through HQ on each lap so there will be lots of cheers and encouragement as you push yourself onto the rest of the course with a water station for refreshment. Transition is located on the Open Grassed Area at the western end of Race HQ. There is a short 100m run from the beach along a concrete path from the swim exit to the transition entry. Racks are signed and each athlete has a 50cm wide allocation. Mountain Bikes are racked by the seat. It is a requirement for all competitors to register in person at the designated times at Race HQ prior to the start of each event. 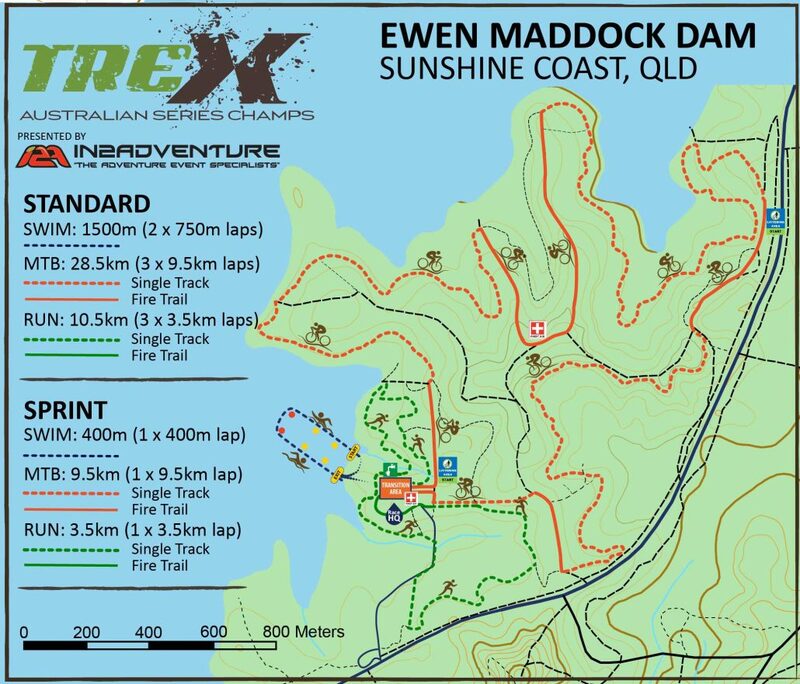 TreX will start at the beach on Ewen Maddock Dam. Prior to the race, there are compulsory race briefings. Maddock Dam is located just one hour north of Brisbane. There is no public transport to the event site and therefore car hire is the best option for making your way to the event. Car hire is available from Sunshine Coast & Brisbane Airports. Before you race into the region, click here to find out more about the Sunshine Coast Airportand transfers – Con-x-ion bus service provides swift and efficient airport transfer service. It is critical that the run number is clearly visible at the finish line to ensure a time is recorded. Safety pins are available for collection near the registration area. The bike number is to be attached to the front handle bars of the bike using the ties provided. It must be easily visible for the entire mountain bike leg for easy video identification and marshal recording throughout the mountain bike lap. Please do not cut or deface the number in anyway as penalties will apply. Ties are available for collection near the registration area. Important: Race Numbers are not to be defaced, cut or altered in any way. Penalties and replacement costs apply where this is not followed. Running shirt/Riding Shirt/Vest: It is a Triathlon Australis requirement that the torso is covered during the bike and run legs. What is the Trex Elite/Open Category? In the circumstance where a TreX event offers prize money greater than $10,000 the category will be defined as either “Professional” or “Elite”. 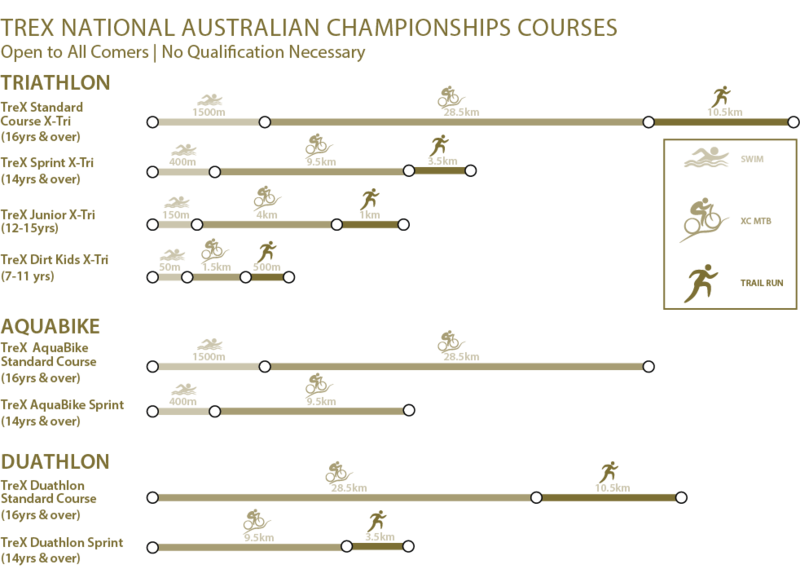 In this circumstance, prize money is only available to appropriate licensed athletes under the TA Professional/Elite License Policy. Presentations will take place when all, or the majority of athletes have finished the event and therefore the times may be earlier or later than advertised. Please listen for announcements at Race HQ for times on the day. Participants are required to be present in person at the presentation ceremony to collect medals and/or prizes.